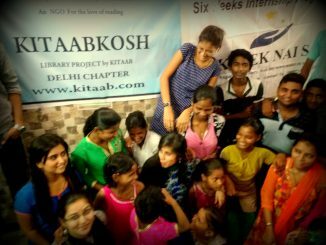 All the students of the school were gathered and an introductory session was conducted by the members of Kitaab Club and the teachers. 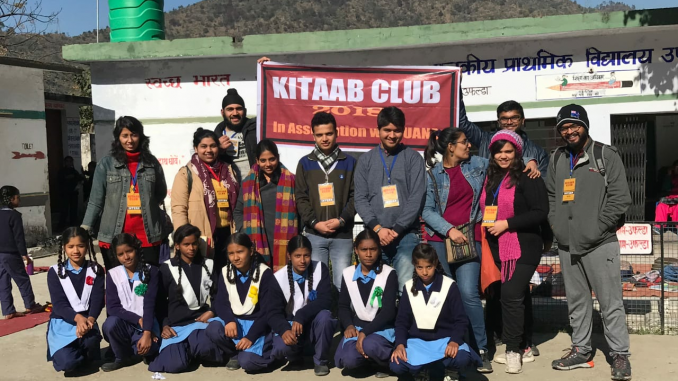 The teachers of the school welcomed Kitaab Club team and introduced themselves which followed the introduction of the managers, interns and the students. 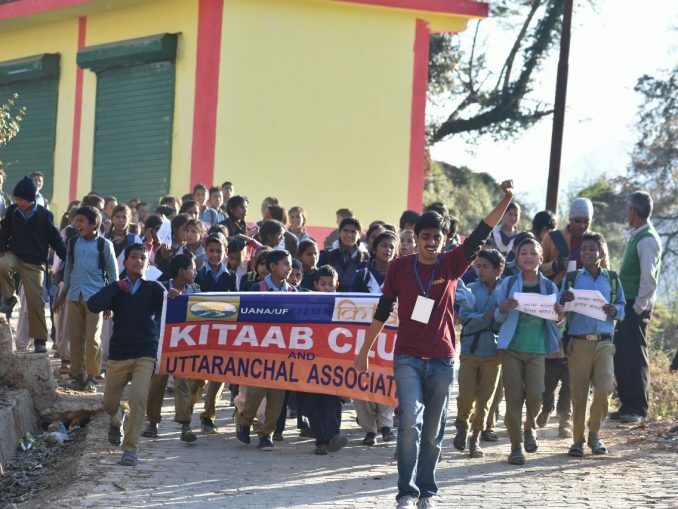 The members of Kitaab Club conveyed their motive of visiting the school in Uphalda. 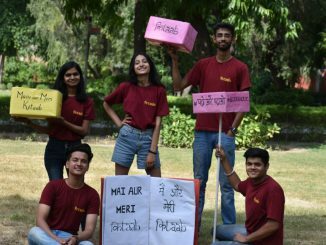 They introduced themselves and also gave a brief about their respective courses to the students to inculcate knowledge about the different fields of education such as literature, electronics, political science, psychology, economics and zoology. All the students introduced themselves either in English or Hindi. They were taught to give a proper introduction in either of the languages. They were also told of having a good command over any of the languages, be it Hindi or English. INTERNS YATIN AND MEHREEN CONDUCTING READING SESSION WITH CLASS 6TH STUDENTS. STUDENTS ARE VERY ENGROSSED WHILE READING THE STORY “THE KING WHO LOVED TREES”. The day began with the volunteers conducting the level grading of students and thus sorting them into groups. The interns were assigned their respective groups wherein they conducted introduction session, ice breaking activities, reading session and other interactive and informative sessions with the students. 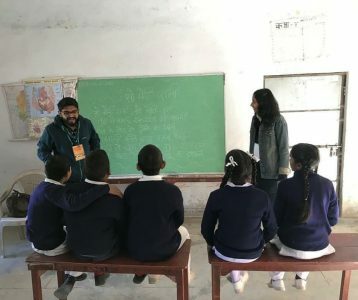 INTERNS PRASHANT, NIKHIL AND PALLAVI CONDUCTING AN ACTIVITY CALLED “STAND UP NUMBERS” TO TEACH MATHEMATICAL CONCEPTS LIKE ASCENDING- DESCENDING TO CLASS 8TH STUDENTS. INTERN UPASANA CONDUCTING THE DRAMA ACTIVITY CALLED “ENACT THE LOCATION” WITH CLASS 9TH STUDENTS THUS BUILDING THEIR CONFIDENCE AND HONING THEIR ACTING ABILITIES. INTERN NIKHIL CONDUCTING YOGA SESSION WITH CLASS 8TH STUDENTS TO MAKE THEM AWARE ABOUT BENEFITS OF YOGA,GOOD HEALTH. 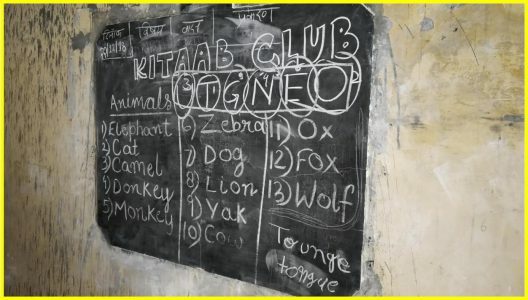 INTERNS YATIN AND MEHREEN TEACHING SPELLINGS OF NAMES OF ANIMALS IN ENGLISH TO CLASS 6TH STUDENTS. 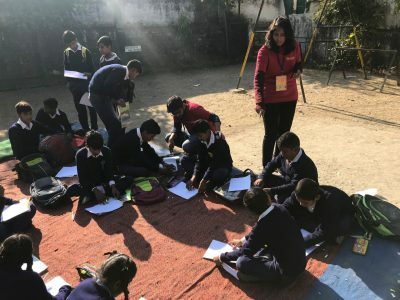 INTERNS KARTIKEYA AND UPASANA MAKING CLASS 7TH STUDENTS READ A STORY IN THE FORM OF A POEM . THE STUDENTS WERE VERY MUCH ENGROSSED AND ENJOYED THIS NEW WAY OF READING . 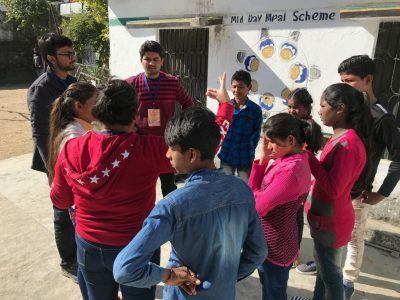 INTERNS YATIN AND MEHREEN CONDUCTING A SESSION WITH CLASS 6TH STUDENTS ON BASIC ETIQUETTES , GOOD HYGINE AND GENERAL AWARENESS LIKE SWACHH BHARAT ABHIYAN AMONG OTHERS AND THUS MAKING THEM PRACTICE A PLAY WHICH TEACHES ABOUT THE SAME. ENVIRONMENTAL CONSERVATION WITH CLASS 7TH STUDENTSAND THUS MAKING THEM PREPARE A PLAY ON THE SAME. INTERNS PALLAVI, NIKHIL AND PRASHANT CONDUCTING A SESSION ON GENDER EQUALITY WITH CLASS 8TH STUDENTS AND THUS MAKING THEM PREPARE A PLAY ON THE SAME. 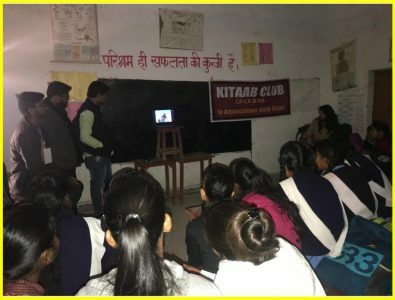 KITAAB CLUB VOLUNTEERS CONDUCTING A MOVIE SCREENING SESSION FOR CLASSES 6TH -10TH . MOVIES ON POLLUTION-PRADUSHANMAAN​ AND ON HEALTHY FOODS WAS SHOWN . POST MOVIE SCREENING ACTIVITIES LIKE QUIZ ROUND ,TEAM COMPETITION WERE HELD AND STUDENTS WERE MADE AWARE ABOUT “WASTE MANAGEMENT” AND “HEALTHY FOODS”. INTERNS MEHREEN AND YATIN CONDUCTING A READING SESSION WITH CLASS 6TH STUDENTS. THE STUDENTS ARE KEENLY ENGROSSED IN THE STORY NAMED “ANDHE AUR LANDE KI DOSTI ’’. “ACT IT OUT” COMPETITION WHEREIN STUDENTS HAD TO ACT ON ANY GIVEN ON THE SPOT TOPIC. 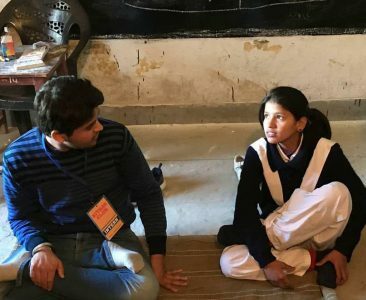 TOPICS SUCH AS CHILD LABOR, IMPORTANCE OF EDUCATION ,ETC WERE GIVEN FOR ACTING TO MAKE THE STUDENTS SENSITIVE ABOUT SOCIAL ISSUES OF THE SOCIETY. The last day we organized an Annual function in which various competitions and skit performances were organized followed by the prize distribution ceremony. The students showed their talent in various fields such as acting, dancing, singing, craft making , poem reciting among others. 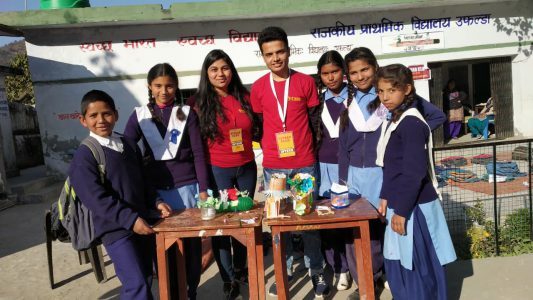 STUDENTS ENGAGED IN “BEST OUT OF WASTE” AND “POSTER MAKING COMPETITION”. GIRLS SHOWCASING THEIR DANCING TALENT IN THE ANNUAL FUNCTION. CREATIVITY AT ITS BEST !! 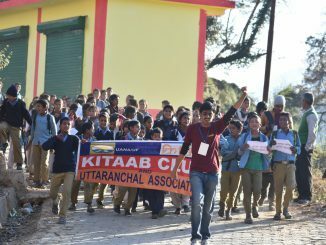 KITAAB CLUB TEAM SINGING A SONG DEDICATED TO THE STUDENTS OF THE SCHOOL IN UPHALDA. PRIZE DISTRIBUTION CEREMONY WHEREIN KITAAB CLUB DISTRIBUTED CRAYONS, PEN, PENCIL AND OTHER STATIONARY TO THE STUDENTS. All the students were immensely talented and full of enthusiasm. They all were ambitious and wanted to reach heights in their lives. They were far more talented than expected due to the lack of opportunities they get in their school. Salute to their jolly spirit and determination to achieve what they want. I am sure that our teaching and collective efforts would have left an impact on each of them which will help them in a long run. In the end changes are noticed in students in their attitude and confidence. The kids we meet first and last day are totally different. They have huge aspirations and goals in their life and now they have a direction which direct them towards right road to success. Now, they have full confidence on themselves. After interacting with students I found that they have enough potential but just they need direction and in turn we gave them right direction. Now in the end they show interest and have gained enough confidence and actively participate in activities. During the internship I identified the needs of different students in my class . Each one of them was different. They needed more time with English than with Hindi. In order to attract all the students of class I tried to make the classes more fun and full of activities pertaining to the subject being taught. Everything wasn’t as expected, which is what was thrilling. New challenges helped me to bring out the best in me. This was an opportunity for me to step in, lead and make a difference in my life and make a positive development impact in the children. 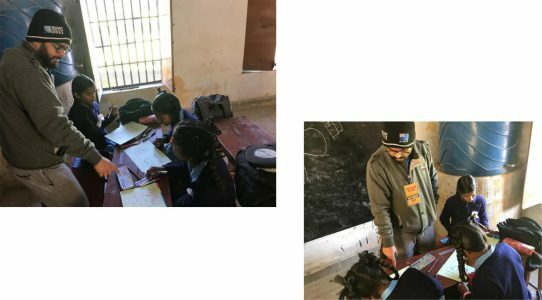 The internship has been an amazing experience for me as I was able to get a deeper understanding of how education system works in Indian society and how complex it gets in rural areas.Every single day of the internship has brought new learnings and experiences for me which I shall always cherish. Living with the co-interns has been a completely new experience leaving me with tons of memories and moments of laughter, cheer and joy that I could never forget. It was a wonderful experience working with such a cooperative and supportive team along with managers who were always helpful and forthcoming in every situation. 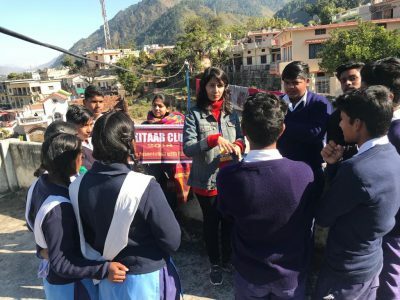 Students in Uphalda gave me a closure from urban lifestyle and opened my eyes to the predicament of schools and children in rural India and how education is becoming a priority slowly. Children with their amazing and innovative ideas and creative skills had left me astonished a lot of times. Given unbiased opportunities and proper nurturing every student of Uphalda has the capability to rise and shine. The thought, that there is still so much we can do for these children, that I didn’t do enough, kept poking me every now and then, somewhere making me guilty too. On the last day when the function had completed, a girl came to me and thanked me for encouraging her and believing in her that she would sing beautifully. In that very moment I realized that these students more than anything needed to know that there are people who believe in them completely. They needed to learn that they are strong enough, beautiful enough, talented enough, and intelligent enough to do or create anything they want. The Students at Srinagar were a highly enthusiastic batch whose energy levels were high since the beginning. 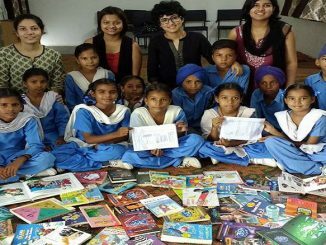 They were very responsive to ask the activities conducted and actively participated in them. The children there are extremely lovable and are always wanting to learn more and more. I would like to give major thanks to Kitaab club and the managers Anuradha and Ramneek for giving me this priceless experience. 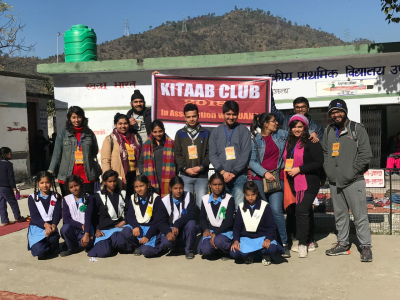 The 10 day winter internship of travel and teach of Kitaab club was an eye opener for me. I had never imagined that it would be so enjoyable and an educating experience for myself. The children I interacted with were very intelligent, full of life and had a quest for knowledge . They grasped the concept of the activities in one go. They were extremely creative and could speak or form a skit on the spot without fear of speaking out in public. I had a wonderful experience at the school in Uphalda, Srinagar, the students were energetic, enthusiastic and very creative. As planned we tried to make our readership program fun and creative and were able to achieve our goals. During this program, we got to learn lots of things. The response from the school was positive and we are glad to have such feedback. The students at the school in Uphalda were extremely creative and talented. Our Readership Program at Uphalda, Srinagar has been a tremendous success and has gained immense appreciation from the school management, teachers and the students. The Readership Program has been very rewarding and a lot of fun. I am very proud of how we have grown as a team and of the work that we have accomplished together. It has been great getting to know my teammates better, as we have tackled some challenging and rewarding situations during the 10 day period. My experience as a Manager has been paramount to me redefining my definition of leadership. I have personally been very fortunate to have had formal opportunities to develop my leadership skills and be provided with opportunities to exhibit it as well. This has given me tremendous exposure to new opportunities and only accelerated my growth as a leader.